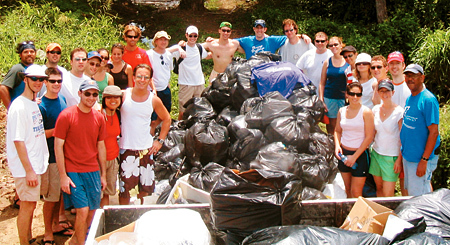 On the Caribbean island of Tobago, Kellogg students collected and bagged more than 1,000 pounds of litter at Big Bacolet Beach. The effort is part of the island's larger environmental initiative to reduce plastic piling up in local landfills. The list of destinations reads like a fantasy brochure for wealthy empty-nesters: the Czech Republic. Argentina. Fiji. Ireland. Alaska. Greece. Spain. Thailand. Brazil. But such trips are a reality for most incoming Kellogg School students, whose graduate experience begins with the Kellogg Worldwide Experiences and Service Trips (KWEST) program. A combination of the erstwhile Kellogg Outdoors Adventure and Kellogg Service Initiative programs, KWEST trips typically include between 15 and 20 first-year students and five second-year chaperones, and the proportion of adventure versus service varies, says Chris Addy '07, president of the organization for 2005-06. "Some of the trips are dedicated almost exclusively to service," he says. "The majority are not, but most will still have some service component." Among the service-related organizations aligned with this fall's program are Habitat for Humanity in Maui; the Fabretto Children's Foundation, which aids underprivileged youth in Nicaragua; and Fundacion Vida Silvestre, an Argentine environmental organization. The combination of adventure and service experiences provides an immediate and lasting bond among new students, Addy says. "Kellogg is a big business school in terms of the number of students," he says. "Going on these trips before beginning class provides a network of second-years you can talk to, and you have a group of 25 really close friends. It's pretty significant in shaping the experience of everybody when they come here." He adds that KWEST provides an opportunity to meet people throughout the student body, not just in one's own academic area. "You meet people from your friends' sections," he says. "It does end up shaping who your friends are." Peru, Costa Rica and Brazil have been among the most popular destinations, Addy says, along with the annual "mystery trip," whose participants don't know where they're headed until they reach the airport. Addy went on the 2005 mystery trip, to the Great Barrier Reef in Australia, which included hiking, sunning, wildlife observation and a visit to the famed Sydney Opera House. Trips for 2006 include a survival adventure in Utah, a salsa trip to Puerto Rico, and an American music heritage tour that will roll through Memphis, Nashville and New Orleans, he says. "We've wanted to have more international [second-year] students lead the trip," he says. "We've been working really hard to make sure every trip has a real meaty service component." 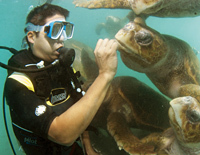 KWESTer Brian Yoon '07 encounters green sea turtles while scuba diving in the waters of Curaçao. Intrepid travelers: With initiatives such as KWEST and Global Initiatives in Management, Kellogg students hit the trail for action learning opportunities. 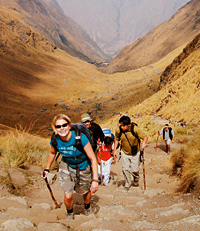 Opposite: During GIM South America's visit to Peru, Melissa Wagamon '07 leads other hikers along a mountainous range. The Kellogg group also visited Argentina and studied Latin America's emerging markets. KWEST is not the only student group at Kellogg that jets off to adventure. The Business Leadership Club (BLC), which works to create a leader-focused culture at Kellogg, has created a pilot journey this spring that combines practical leadership skill development with outdoor adventures, says Tejus Korde '06, club president for 2005-06. "We went to the Sierra Madre mountains in Mexico with a vendor called Boulder Outdoor Survival School," he says. "We hope this Experiential Leadership Pilot will blossom in the next few years." The BLC continues to offer plenty of valuable experiences on campus, most visibly through promoting the Office of the Dean's executive-in-residence series that brings high-profile corporate leaders to the school, as well as guest speakers such as Kellogg Company CEO James Jenness and Credit Suisse First Boston COO Brian Finn; who appeared during the winter quarter.Korde expects the series to heat up during the spring, culminating in the "Talk of the Year." Last year's featured speaker was Jack Welch, ex-chairman and CEO of General Electric. The 50-member club also presents an annual Award for Distinguished Leadership, sponsored by McKinsey & Co., that last year was bestowed upon Larry Bossidy, former Honeywell CEO and an author of business-related books. Other club activities underway are leadership development seminars in conjunction with TeaMBAnk, a centralized repository of resources created exclusively for Kellogg MBAs that offers monthly seminars and personalized consulting services for student groups. "The focus is really to help students revisit their 360-degree leadership focus, take a series of personality tests to figure out their leadership style and create a plan of action for enhancing their leadership skills," he says. "That's been our mission and one of our objectives since our inception, and we've stayed the course."